Special Containment Procedures: SCP-2151-A and SCP-2151-B are to be kept in separate high security containment lockers at Site-81. Testing of SCP-2151-A and -B is currently suspended. SCP-2151-1A is to be maintained at Site-81 indefinitely, or until SCP-2151-1A expires. 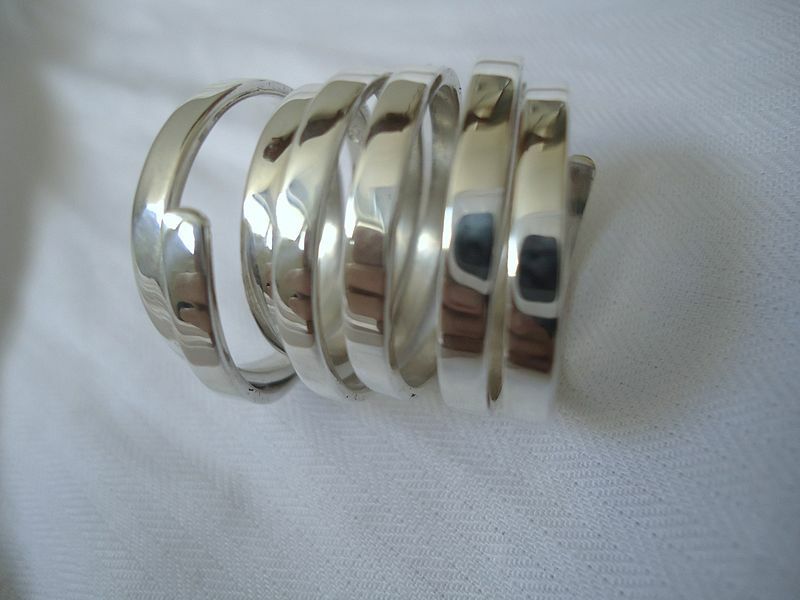 Description: SCP-2151-A and SCP-2151-B are nearly identical stainless steel rings. Aside from their effect on human wearers, they present no other anomalous properties. When two human beings wear SCP-2151-A and SCP-2151-B, any physical contact between them will activate SCP-2151-A and -B. Immediately upon contact, the two instances will increase dramatically in temperature and burn into the skin of the wearer. This happens quickly, and typically takes less than 20 seconds before the objects disappear under the skin of the wearer. The point of contact between the two subjects will also increase in temperature, often resulting in severe burning in the area, and the skin there will fuse. As time passes, more and more of the skin connecting the two individuals will become fused, eventually consuming the entire bodies of both subjects. Over time, the distinguishing characteristics of the individual subjects will become distorted and unrecognizable from their original state, and many of the biological functions of the individuals will shut down entirely1. The resulting entity is classified as SCP-2151-1(X). It is currently uncertain whether any higher mental functions are maintained throughout this process. At the end of this process, SCP-2151-A and SCP-2151-B will be pushed out of the resulting body by seemingly natural processes. No other anomalous activity occurs past this point. SCP-2151-1A is an entity believed to be the product of SCP-2151-A and SCP-2151-B's effect on two human beings. This entity was discovered at the home of Mr. █████ and ███████ ████████, in the room of [DATA EXPUNGED: See Addendum 2151/A for more information]. Despite additional instances of SCP-2151-1(X) expiring shortly after formation, SCP-2151-1A has persisted for more than 30 years since discovery. Research into how this is possible is ongoing. Information restricted to Level 3/2151 personnel or above. SCP-2151-A, -B, and -1A were initially discovered in the home of Mr. █████ and ███████ ████████, in the second floor room of their youngest daughter, Monica ████████. Current SCP-2151 timelines have revealed that the initial contact event began on September 17th, 1971 at roughly 1900 hours, when Mr. █████ and ███████ ████████ were away from the home. Upon discovery of the SCP-2151-1A entity, Mr. ████████ alerted the local authorities, and Foundation agents intervened. Amnestics were applied to the family, and cover story P315B "Fatal Car Accident" was spread through the local community. Handwritten note on photograph, origin uncertain. It is currently believed that Monica ████████ was wearing SCP-2151-B at the time of contact, due to genetic material belonging to her that was recovered from the object. 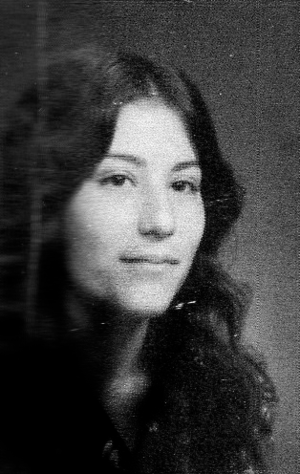 The other individual has not yet been identified, although genetic material collected from SCP-2151-1A has shown that the subject was likely approximately 50 years of age, and shared at least ██% of their genetic material with Monica ████████. 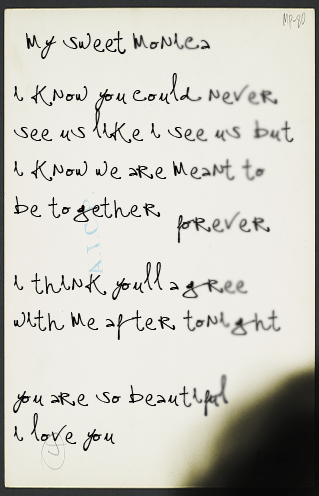 The following note was discovered on the back of a photograph of Monica ████████ located in a wastebin in her bedroom. The origin of the image, and the author of the note, are both undetermined. 1. Similarity in this process to the creation of instances of SCP-427-1 has been noted. The potential of a similar origin for SCP-2151-A and -B, and SCP-427 is currently under investigation.